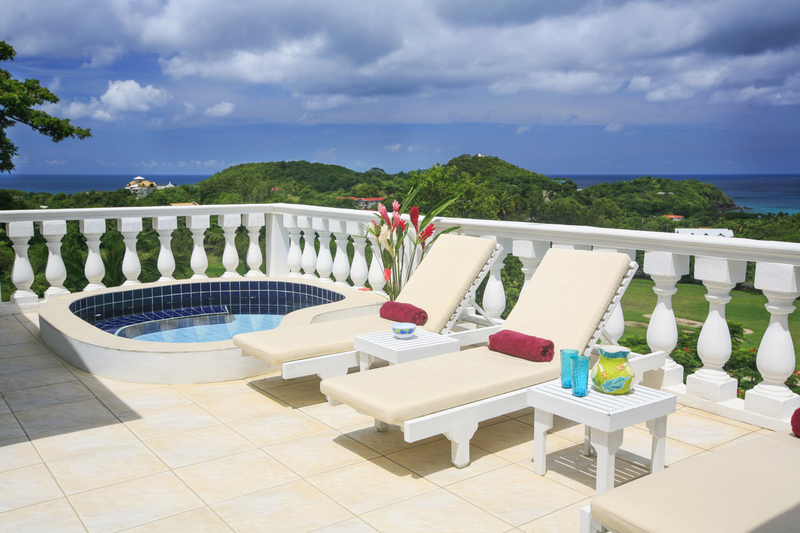 Occupying a commanding position above the fairway of Saint Lucia’s only golf course, Villa Blue Moon is an impressive, three-storey villa. 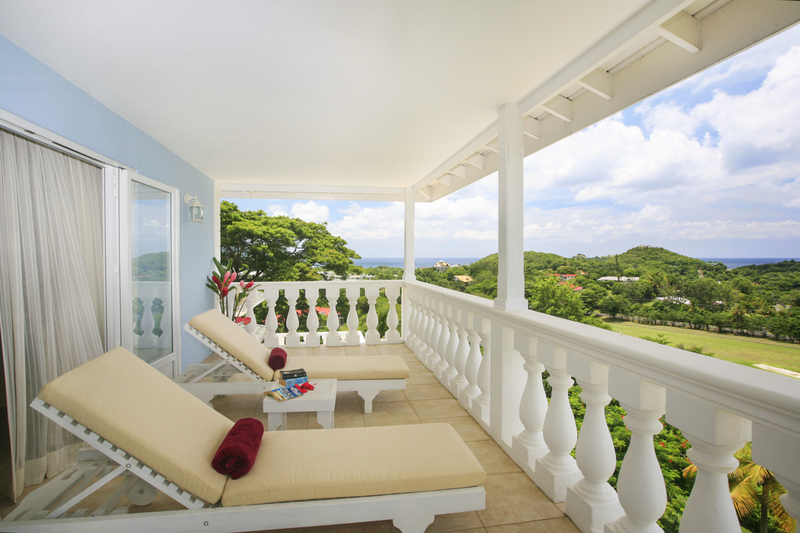 The upper floor is given over to the spacious master suite, complete with king size bed, en-suite bathroom and private balcony which provides its lucky occupants with views of the fairway, tree-clad hills and sparkling sea. 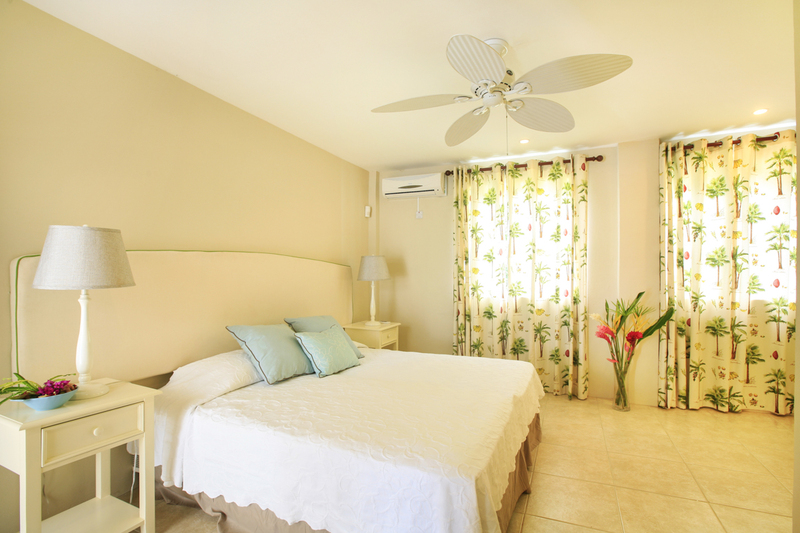 Down to the middle level, bedroom two is flexible, with twin beds which can be converted to a king size double and bedroom three has a queen size bed. 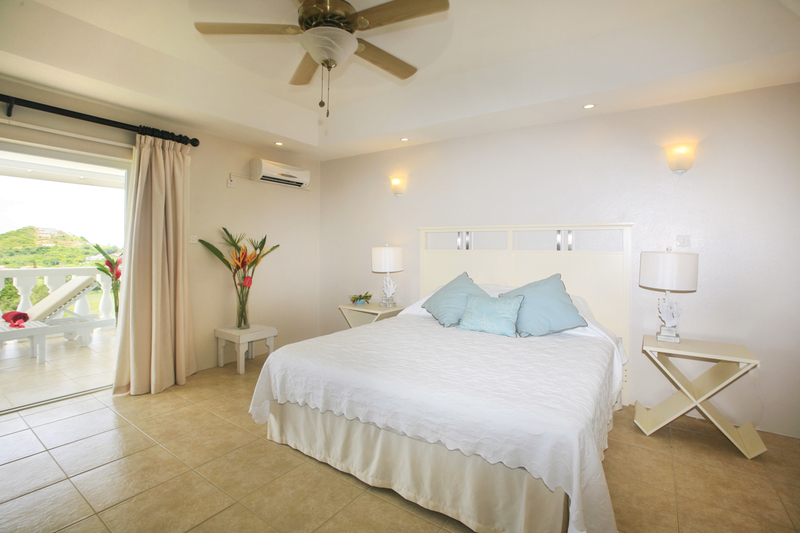 Both rooms boast en-suite bathrooms and direct access out to your sun-drenched patio. 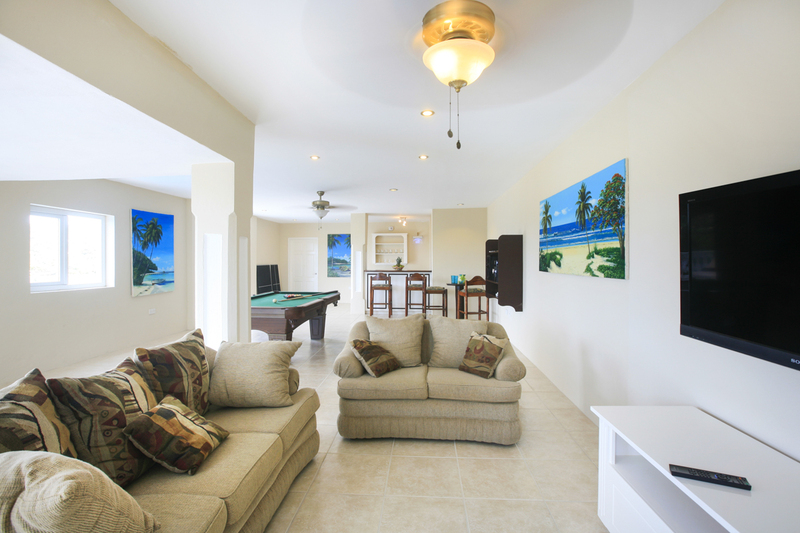 Also, on this level, you’ll find Villa Blue Moon’s relaxed open plan lounge and kitchen area. Start the day with orange juice and tropical fruit and then move to the generous patio with an unhurried cup of coffee. 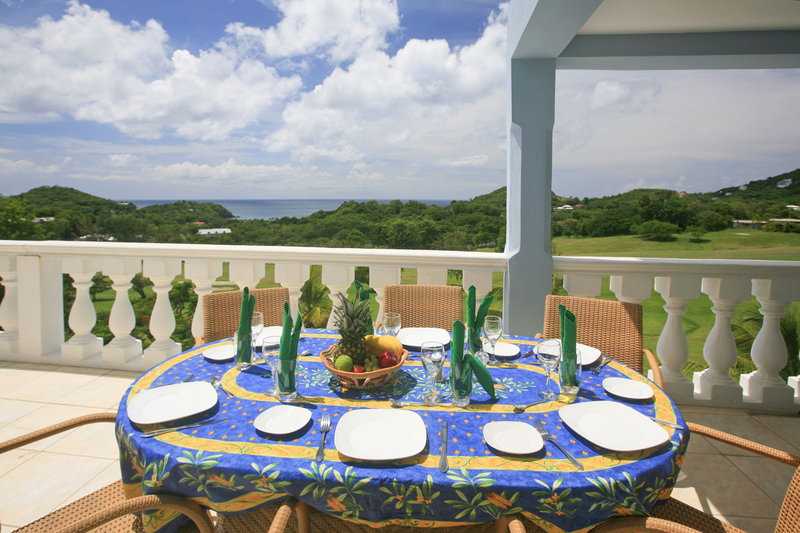 Your al fresco dining table overlooks the green, the hills and the sea, and this beautiful view will be the backdrop to relaxed breakfasts, lunches and dinners throughout your stay. Move along the covered patio to find inviting sun loungers, just waiting for someone to take it easy. And as if this wasn’t heavenly enough, there’s a plunge pool tucked in the corner, for even more indulgent moments of gazing out across your view. 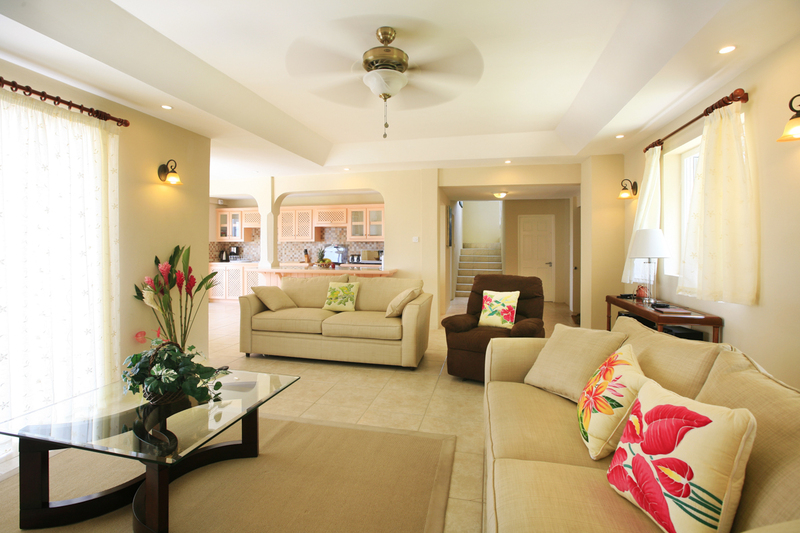 Villa Blue Moon’s lower level comprises a second patio, a private pool and even more sumptuous sun loungers. Sunbathe, snooze, swim and splash. Lazy afternoons simply don’t get better than this. Beyond this outdoor terrace, you’ll find a large games room with a pool table, television, stereo and table tennis board and it’s from here that you access bedroom four. 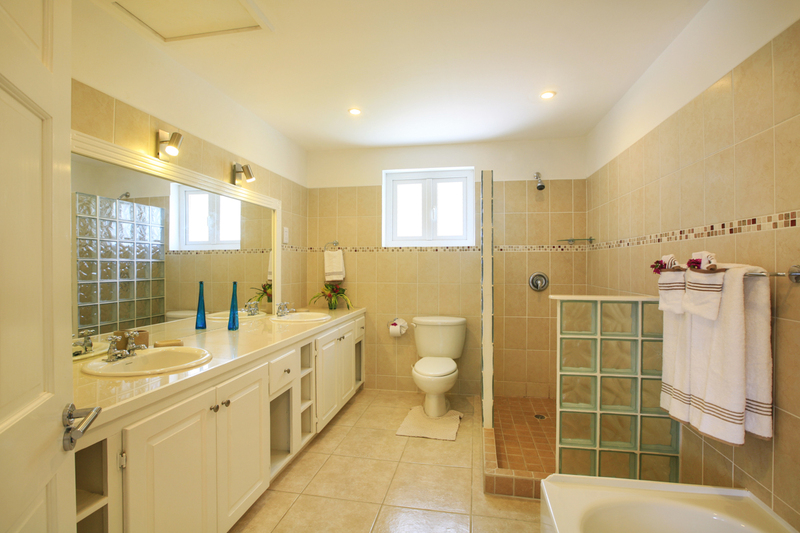 Again, two single beds can be joined to make a king size double and it has an en-suite bathroom. This annexed room is ideal for independent children or those wanting their own space. 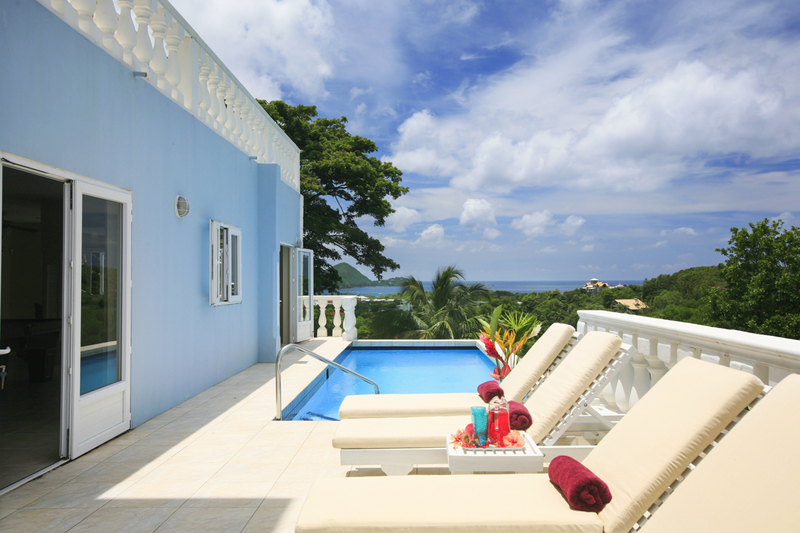 Surrounded by an acre of lawned gardens, delightfully dotted with palm trees and tropical plants, Villa Blue Moon is an idyllic base for a family holiday, golfing break or Caribbean adventure with friends. 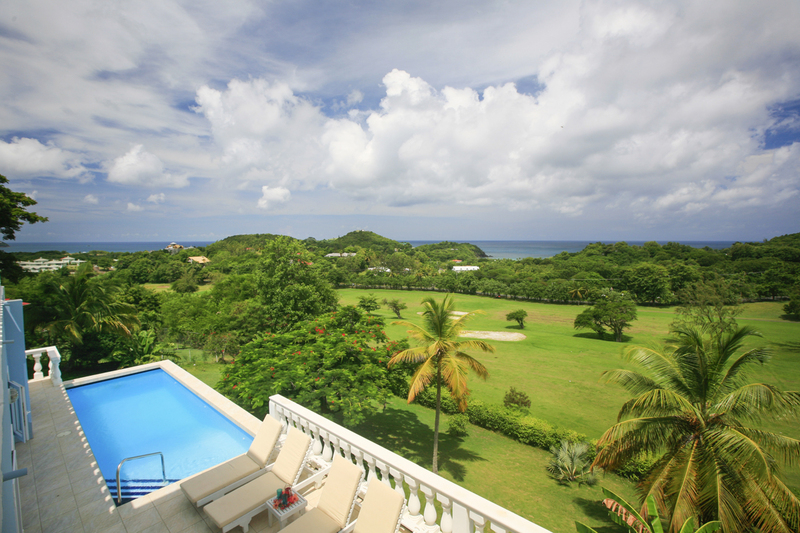 The golf course is an obvious benefit to staying at Villa Blue Moon. But Cap Estate also features a couple of restaurants and easy reach to several fabulous beaches. You also have Rodney Bay and Pigeon Island just a short distance along the coast. Cap Estate lies in the north of Saint Lucia and is home to several beautiful beaches, the island’s only golf course and picturesque scenery. Villa Blue Moon belongs to the exclusive community of luxury villas within Cap Estate and has an eighteen-hole, championship standard golf course on the doorstep. 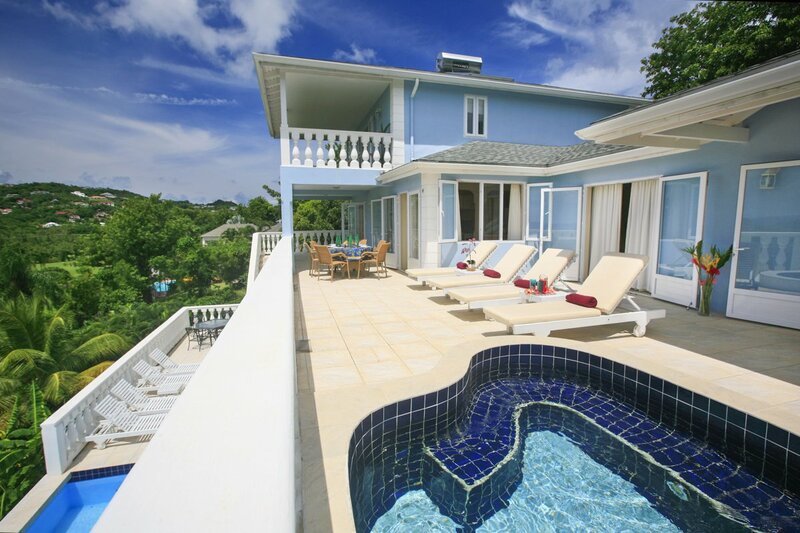 Villa Blue Moon may be a golfer’s dream, but it’s also perfect for those intent on sea, sand and sun. Anse Du Cap is one of your nearest beaches, with lovely black sand and calm, warm waters for swimming. Pigeon Point Beach, running alongside the iconic landmark, has white sand and picturesque views. 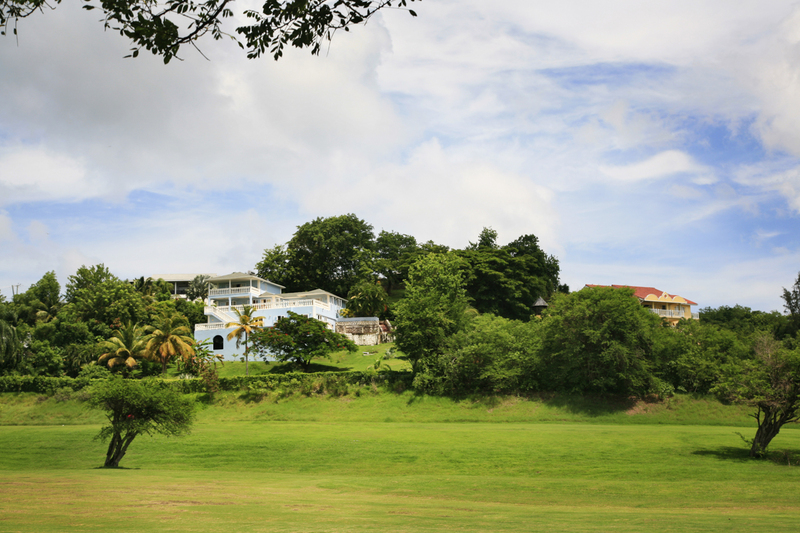 Worthy of a full day out, bring a picnic and take a walking trail through the National Park surrounding the peak and historic fort. Rodney Bay, just a ten-minute drive from Villa Blue Moon, is a visitor hotspot along this western coastline. Find super-sleek yachts at the marina, a state-of-the-art diving school and waterfront bars and restaurants. Reduit Beach is beautiful, lively and full of Caribbean vibe. Have fun on inflatable rides, hire sun loungers and umbrellas and sip fresh coconut juice or cocktails at beach-side bars. Just beyond the marina, shoppers will love the Baywalk Mall; a mammoth shopping complex with over eighty shops, restaurants, bars and a casino. If you want to travel a little further, why not take the Dollar Bus? It’s a relaxed, cheap and fun way to get around the island. 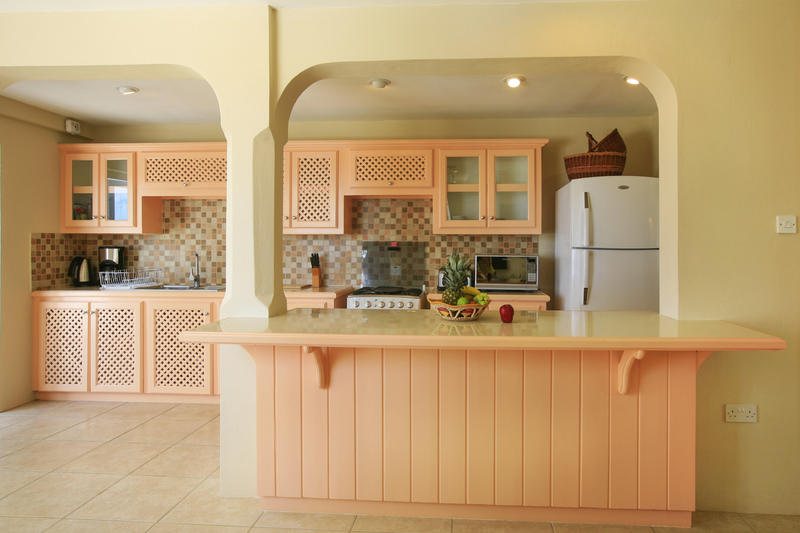 The service consists of privately owned sixteen-seater vans, between Cap Estate, Rodney Bay and Castries. Either wait at a bus stop or just flag one down en-route! Castries’ Saturday morning market is a sensory experience. Stroll around stalls piled high with spices, fruit, rum and other culinary delights from the Caribbean.